A couple years ago when I picked up The Queen of Blood, I had no idea it was going to grow into a series I would enjoy and love so much. Two more books later, the Queens of Renthia trilogy is now complete, and what an incredible journey it has been with this strong cast of powerful, fascinating women and the world of dangerous spirits in which they live. In the first book, readers got to meet Daleina, a young Queen candidate who came from a humble background with less than stellar magical abilities. However, hard work and tragic circumstances ultimately led her to the throne of Aratay, her forest kingdom. Book two introduced us to another Queen, but Naelin is as different from Daleina as night is from day. Middle-aged and a mother of two, Naelin is naturally gifted with immense power, but without the years of formal training most candidates receive, her magic is raw and untamed. Unlike Daleina, she also never wanted to be Queen, content just to raise her family in seclusion and quiet. It is highly recommended that you read the first two books before jumping into The Queen of Sorrow. While theoretically The Queen of Blood and The Reluctant Queen can be considered standalone companion novels, this third one on the other hand is the culmination of events from both and will tie everything together. Be aware that this review might also contain possible plot details for the previous books if you’re not caught up yet. Aratay now has two queens, and with Naelin sharing the responsibility of keeping the vicious spirits of the natural world at bay, Daleina believes her kingdom finally has a chance at peace. But then Naelin’s children are kidnapped and taken to neighboring Semo, a country ruled by none other than Queen Merecot—once Daleina’s friend and former schoolmate. Needless to say, their relationship has soured since Merecot tried to kill Daleina and take over Aratay, but it appears the Semoian queen is far from done with her scheming. Filled with a mother’s rage and sorrow, Naelin ends up tearing the land apart in her desperate attempt to take back her stolen children, leaving the kingdom in worse shape than ever before. I just want to say I love these characters. 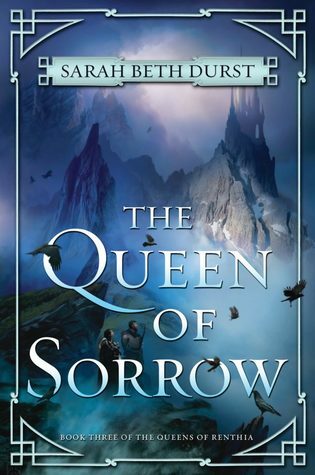 Sarah Beth Durst continues to impress with her deep explorations into Daleina and Naelin’s personalities and motivations, and in The Queen of Sorrow, we also have the added treat of getting to know the series antagonist. Yes, the clever and manipulative girl we first met in The Queen of Blood before she was kicked out of candidate school has become a force to be reckoned with. I knew we hadn’t seen the last of Merecot, and I was glad this book gave her character such detailed attention. She now joins the ranks of my favorite complex villains of all time. Even though she is a megalomaniacal conniving narcissistic kook, you can’t help but feel for her. Despite her detached and calculating view of the world, Merecot’s twisted actions are ultimately all for the sake of her country and people. And indeed, Durst examines how far each queen would go to achieve everlasting peace. For Merecot, it may be a numbers game. For Naelin, however, it’s her children’s lives above all others. One thinks with pure logic, while the other reacts with pure emotion. With Naelin having shown that she is willing to let the entire world burn as long as it means her own children will be spared, Merecot’s methods might even start to seem sane, and yet, I also believe it would be much easier to sympathize with the former’s viewpoint if you are a parent. At the end of the day though, it’s probably safe to say that neither queen possesses the qualities of a good leader, and so Daleina can be seen as the mediating force between their two extremes. The author presents this trio of personalities so well, that I think it might be my favorite aspect of this novel, but I also adore the supporting cast and their relationships with the protagonists. There is some light romance involved, but I’m happy to say it’s only a small part of a bigger picture containing more complex and dynamic relationships. I enjoyed seeing how this concluding volume brought many of those connections to fruition, even the ones involving more minor characters. In fact, some of those peripheral characters ended up being my favorites, like Garnah or Hanna. Bottom line, I think it’s safe to say if you enjoyed the first two books, then you will love The Queen of Sorrow. The book builds to an incredible climax and finale, one that will be intensely rewarding to readers who have followed the story since the beginning. All the characters have grown so much and have triumphed over so many obstacles and hardships, it’s hard not to feel a deep sense of joy and satisfaction at this beautiful conclusion even as I sadly bid farewell to the series. The Queens of Renthia has made me a fan of Sarah Beth Durst for life though, and I will look forward to her future projects with great enthusiasm. I’m glad this was so good, I can’t wait to read this series. It sounds like one I’d really like, and I did read a little of the first book a while back and was definitely intrigued! Yeah, it’s hard to believe how far these characters have come. They’ve really grown with the series! Yay, I hope you’ll enjoy it! Great review! I need to finish this series apparently!!! Lovely review! I can’t wait to start this series! Thanks! Hope you get a chance to get to it soon! Great thoughts. I really want to start this series now. I think that this cover is my favorite of all three and a perfect way to end the trilogy – on a “cool” note. I agree, I love the covers to all three books, they’re done so well! Haha, yes! I love this shade of blue too. it looks like everyone had a great time with this last nove! Yes, I’ve been seeing the reviews, it seems others really enjoyed it too! Having heard nothing but glowing praise about this series, I can’t delay any longer and place it high in my “wanted” list: the fact that the trilogy is now complete is indeed a further enticement, since I will have to suffer no waiting time between books. This series has been on me list long enough that I now see it has been completed. Well I guess one day I can binge read them all. Lovely review. I haven’t read any of this series, but your review made me really happy. 🙂 I plan to read her new middle grade book soon. Me too! Very excited for it! I just perused my Goodreads, and apparently the bloggers I follow say they DNF’d this series, which makes this all the more promising to me. 😂 I seem to like boring books that everyone else DNF’d, so I’ll be sure to check it one out one day. Great review! I’m not a huge fantasy reader but for some reason this series sounds appealing to me. Love that cover! Happy to see this ends on a good note. I’m hoping to start No.2 shortly.